"The conscious and intelligent manipulation of the organized habits and opinions of the masses is an important element in democratic society. Those who manipulate this unseen mechanism of society constitute an invisible government which is the true ruling power of our country. Adam Curtis' acclaimed series examines the rise of the all-consuming self against the backdrop of the Freud dynasty. To many in both politics and business, the triumph of the self is the ultimate expression of democracy, where power has finally moved to the people. Certainly the people may feel they are in charge, but are they really? The Century of the Self tells the untold and sometimes controversial story of the growth of the mass-consumer society in Britain and the United States. How was the all-consuming self created, by whom, and in whose interests? The Freud dynasty is at the heart of this compelling social history. Sigmund Freud, founder of psychoanalysis; Edward Bernays, who invented public relations; Anna Freud, Sigmund's devoted daughter; and present-day PR guru and Sigmund's great grandson, Matthew Freud. Sigmund Freud's work into the bubbling and murky world of the subconscious changed the world. By introducing a technique to probe the unconscious mind, Freud provided useful tools for understanding the secret desires of the masses. Unwittingly, his work served as the precursor to a world full of political spin doctors, marketing moguls, and society's belief that the pursuit of satisfaction and happiness is man's ultimate goal. Please Note: Viewers should be sure to read Ludwig Von Mises' 'The Anti-Capitalist Mentality' to balance the socialistic elements of this film. The story of the relationship between Sigmund Freud and his American nephew, Edward Bernays. 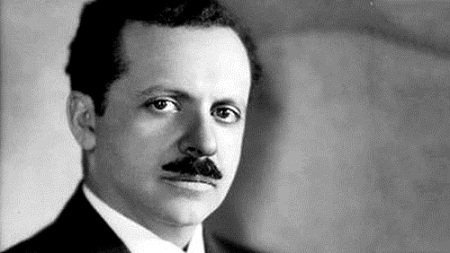 Bernays invented the public relations profession in the 1920s and was the first person to take Freud's ideas to manipulate the masses. He showed American corporations how they could make people want things they didn't need by systematically linking mass-produced goods to their unconscious desires. His most notorious coup was breaking the taboo on women smoking by persuading them that cigarettes were a symbol of independence and freedom. But Bernays was convinced that this was more than just a way of selling consumer goods. It was a new political idea of how to control the masses. By satisfying the inner irrational desires that his uncle had identified, people could be made happy and thus docile. It was the start of the all-consuming self which has come to dominate today's world. See Ludwig von Mises "The Noneconomic Objections to Capitalism" and "The Argument of Happiness" to balance the propaganda in this section. The programme explores how those in power in post-war America used Freud's ideas about the unconscious mind to try and control the masses. Politicians and planners came to believe Freud's underlying premise - that deep within all human beings were dangerous and irrational desires and fears. They were convinced that it was the unleashing of these instincts that had led to the barbarism of Nazi Germany. To stop it ever happening again they set out to find ways to control this hidden enemy within the human mind. Sigmund Freud's daughter, Anna, and his nephew, Edward Bernays, provided the centrepiece philosophy. The US government, big business, and the CIA used their ideas to develop techniques to manage and control the minds of the American people. But this was not a cynical exercise in manipulation. Those in power believed that the only way to make democracy work and create a stable society was to repress the savage barbarism that lurked just under the surface of normal American life. In the 1960s, a radical group of psychotherapists challenged the influence of Freudian ideas in America. They were inspired by the ideas of Wilhelm Reich, a pupil of Freud's, who had turned against him and was hated by the Freud family. He believed that the inner self did not need to be repressed and controlled. It should be encouraged to express itself. Out of this came a political movement that sought to create new beings free of the psychological conformity that had been implanted in people's minds by business and politics. This programme shows how this rapidly developed in America through self-help movements like Werber Erhard's Erhard Seminar Training - into the irresistible rise of the expressive self: the Me Generation. But the American corporations soon realised that this new self was not a threat but their greatest opportunity. It was in their interest to encourage people to feel they were unique individuals and then sell them ways to express that individuality. To do this they turned to techniques developed by Freudian psychoanalysts to read the inner desires of the new self. Both New Labour, under Tony Blair, and the Democrats, led by Bill Clinton, used the focus group, which had been invented by psychoanalysts, in order to regain power. They set out to mould their policies to people's inner desires and feelings, just as capitalism had learnt to do with products. The politicians believed they were creating a new and better form of democracy, one that truly responded to the inner feelings of individual. But what they didn't realise was that the aim of those who had originally created these techniques had not been to liberate the people but to develop a new way of controlling them.